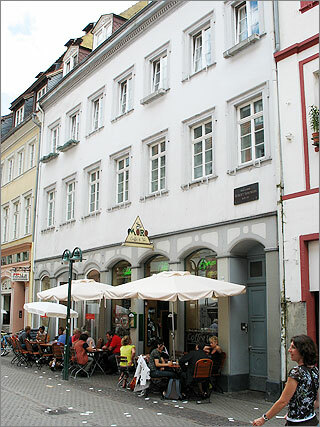 Robert Schumann spent 16 months in Heidelberg. On 21 May 1829, he came here as law student and left the city on 24 September 1830 with the decision to become artist. Inbetween he spent a lot of time on journeys. The decision to study law was required by the mother. The first study place was Leipzig (1828/29), which he left with enthusiastic hopes towards Heidelberg. The law school first definitely appealed to him. Among the students he found friends, and his law professor Anton Friedrich Justus Thibaut invited him to his legendary singing circles. 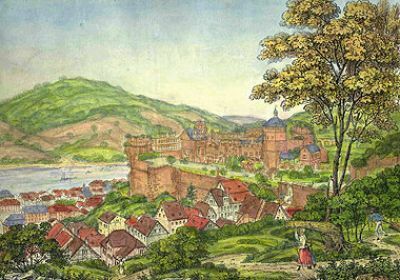 The landscape around Heidelberg and the drinking habits of the Pfalz impressed him. Schumann's main interest was music. He sat at the piano every day. 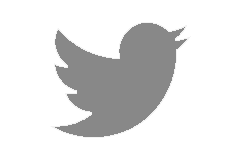 The correspondence displays the priority of music in the literature needs. Schumann took part in Thibaut's singing circle and attended concerts in the city and the surrounding area. He played piano in some private houses and had on 24 January 1830 his last public performance as a pianist in the concert hall of the museum society, where he played Moscheles' Alexander variations. And he started to compose: The Abegg Variations Op. 1, the Papillons Op. 2 and the Toccata for Piano Op. 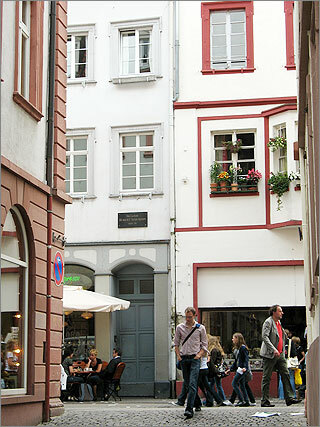 7 were started in Heidelberg. 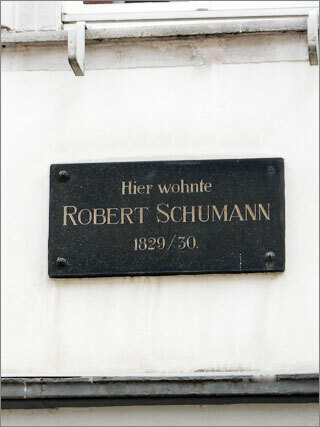 On 30 July 1830, Robert Schumann wrote from Heidelberg to his mother: "In Leipzig, I drifted along unconcerned in some life plan ... here I have worked more, but here and there I always sticked intimately and closely to the art. Now I am standing at the crossroads and frighten ask myself the question: Where to? I follow my genius, it directs me to the art, and I think it is the right way." After his arrival in May 1829, Schumann put up at first at the „Badischer Hof“, one of the biggest hotels this time, which extended to several houses (today: Hauptstraße No. 113, No. 113a and No. 115). At the Universitätsplatz the today called „Old” University is relocated, which was back then the only central building of the university. Here was the registration into the Matriculation book, and in the Pandektensaal of the today’s great hall, Thibaut gave his lectures. The auditorium was redesigned into the style of historicism on occasion of the jubilee in 1886. On the south side of Universitätsplatz is the New University of 1931. Before that there was standing the house of the museum’s society built in 1828. This association aimed the promotion of cultural and social life of upper middle class. Schumann was a frequent visitor here and was also performed publicly as a pianist. Schumann's first address was at Fuhrmann Panzer. The proximity to the insane asylum and the sound of the Catholic bells however bothered him. Instead of the former apartment building is now the former municipal court and present Roman Department of the University (Seminarstraße 3). He found his final residence in October 1829 at the merchant Ritzhaupt, the hotelier of „Zu den drei Königen“ in the Hauptstrasse. Schumann was allowed to play indefinitely the piano and gave piano lessons to the son of his landlord. At the „Drei Könige“, also Mozart, Goethe and Tieck already put up. Today a plaque on the facade refers only to Robert Schumann (Hauptstraße 160). Schumann often participated in the famous singing circle in the house of the lawyer Anton Friedrich Justus Thibaut, where in the spirit of Romance old music was discovered and practiced; Palästrina and Händel were Thibaut’s most preferred composers. Schumann admired Thibaut as lawyer as well as music-lover, without sharing his rejection of contemporary art. The baroque building was demolished in 1961. In the new building is nowadays located the faculty for deacony studies of the university. (Karlstraße 16). Heidelberg is the former residence of the Prince-electors and the Count Palatines of the Rhine, today famous for its castle ruins and the university. Heidelberg is after Mannheim and Ludwigshafen, with 145.000 inhabitants the third major city in the metropolitan region Rhine-Neckar. Heidelberg has a rich cultural life. The Philharmonic Orchestra of the city performs at the operas of the municipal stages and in own concerts. The International Music Festival “Heidelberger Frühling” outshines far beyond Heidelberg every year. The urban music and singing school is one of the largest facilities of its kind in Baden-Württemberg. The musical life of the city is also supported by a large number of other orchestras, ensembles and choirs, which perform partly professional, partly as laymen under professional conduction. Among others are The Klangforum, the society of music and art lovers, the Heidelberg Symphony Orchestra, the Bach Choir of Heidelberg, the student choir, the Cappella Palatina and many others. Other festivals are Enjoy Jazz, LINKS. Heidelberger Biennale für Neue Musik, „Heidelberger Kirchenmusiktage“ and the Chanson festival „Schöner Lügen“. 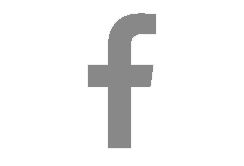 Among academic institutions are the Department of Musicology of the University and the College of Church Music. Many of these institutions will participate in 2010 with concerts, events and projects at the Schumann year.